It does begin on a grim note, in black and white, as we are introduced to little boy Raja who is ill. His fretting mother (Indrani Mukherjee) is forced to go to her wealthy employer (?) to ask for money for his treatment. Her unscrupulous boss will give her money on one condition—she must become his mistress. Desperate, she agrees to meet him that night and little Raja gets his medicine. Sadly, though, she decides that she can’t go through with her agreement and takes the only way out she can think of—leaving her poor little son in better health, but orphaned. The logic of this escapes me, but I guess desperation and logic often part ways. A little guy who is forced to bring himself up doesn’t have many options either, and he quickly takes to stealing. He grows up to be a professional chor although not a competent one (a somewhat endearing characteristic, actually). He is continually caught and put in jail, and the Jailor has despaired that Raja will ever mend his ways. He does have oodles of charm and his own code of principles, though. He fences his stolen goods through Lalaji (Asit Sen) (and may I say that Rajesh does an excellent impersonation in a scene with him of Asit Sen’s unique speaking voice, which clearly amuses both of them no end) and has a best friend in Tony (VK Sharma), with whom he shares an old abandoned boxcar as a home. Tony works off and on as a conman and pickpocket, but has an obvious problem with alcohol and a fondness for a girl named Mary from Goa who sends him love letters. Raja supports them with his thieving, but disapproves of Tony’s drinking. At night he prowls the neighborhoods of Bombay—this gives little vignettes of city life which are very cute, as when he breaks into the home of an unhappy woman named Anita (Farida Jalal) whose philandering husband (Sujit Kumar) neglects her. She has taken a potent sleeping draught and passed out; Raja helps himself to it as well and falls asleep next to her, enraging her husband when he finally comes home drunk. He is chased one night into a house decorated for a wedding, where he finds a note alongside the groom’s wedding outfit. The groom has fled his arranged marriage, and as the priest and the groom’s parents (Iftekhar and Dulari) call for their son to come and get married the police also arrive. Cornered, Raja dons the flower-bedecked turban and gold sherwani and marries the poor unsuspecting bride as the police search the house. The bride, Nirmala (Sharmila Tagore), is an orphan brought up by her uncle (Uma Dutt) and aunt (Praveen Paul), who consider her a burden. She begs Raja (still thinking him to be Suresh, her intended) not to leave her but he escapes down a back fire exit, leaving Suresh’s note and clothing behind along with his sad new wife. Despite these herculean efforts at going undetected, Raja is caught by the police that same evening and sent back to jail. More tragedy strikes that night when the real Suresh is killed in an accident. Still unaware that she was actually married to someone else, Nirmala is kicked out of the house by Suresh’s parents and sent home to her aunt and uncle, who also want nothing more to do with her. Alone, frightened, and on the street, she is also left with very few choices. 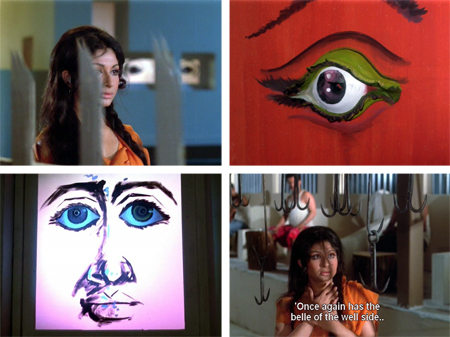 Accompanied by what I will always call “The Eye Song” (its actual name is “Phir Ankh Se Ansoo”) with its starkly symbolic…well, eyes, and sundry sharp objects to poke them with, Nirmala wanders the bylanes and ends up in a kotha clutching a pair of ghunghroos. Six months pass, and Raja is let out of jail. Feeling guilty, he goes to the house where he had accidentally gotten married and is told by the neighbors of Suresh’s death and that the family no longer live there. Then he discovers that his boxcar home is now inhabited by strangers—Tony has sold it while Raja was in the Big House. With nothing much else to do, he goes back to stealing—and lands up in Nirmala’s house, where she is now a full-fledged nautch girl calling herself Ranibai. When one of her customers, Govardhan Das (Raj Mehra), becomes a little too forward for her liking Raja rescues her and throws Govardhan out. They flirt a little and he chastises her gently for her profession—but she tells him she has to survive. Police sirens come closer and he takes his leave—and Rani covers for him when they come looking for Raja. Raja hits the jackpot soon after when he robs a home where there is some very nice jewelry lying around. This is so so cute—he touches her face and as she turns in her sleep (although how she can sleep on those sheets befuddles me) he murmurs “You are something special.” Melt, melt, melt! He steals all her jewelry, but leaves a nice note in lipstick on her mirror. He finally tracks his pal Tony down, and wheedles/blackmails a place for them to live out of Lalaji. To celebrate their reunion and new home, he takes Tony to see beautiful Rani, whom he has been unable to forget. She dances for them despite it being her day off (she fasts and worships once a week like a good girl). It is pretty evident that as smitten as Raja is, so is Rani—albeit with some reasonable misgivings. Ramesh Pant wrote the dialogues for this movie, and they are most excellent. They make a pact to each give up their current “profession” in order to build an honest and respectable life together. But will society let them? 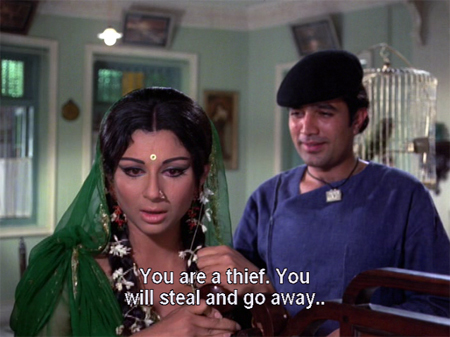 Rani has some wealthy and influential customers who would rather keep her to themselves, and Raja’s reputation as a thief is widespread. Can these two outcasts find happiness together? And will they ever find out that they are already married? You will really want them to, unless your heart is a lot blacker and stickier than mine! This is a very simple and straightforward story with messages I can mostly get on board with, done with finesse. Beautiful Kumari Naaz shows up later and so does “this guy”—anyone know what his name is? I feel certain I should know, but I can’t come up with it. Posted on August 14, 2010 at 6:59 pm in Hindi movies	| RSS feed You can skip to the end and leave a reply. I remember seeing this movie a while ago. I don’t remember many of the details though. Oh yes! I remember Jab Andhera hota hai was a huge hit. Mein ik chor was also catchy. But the movie was a flop if I remember rightly. I can’t remember why I didn’t see this movie. I saw practically every movie in the early 70s. Don’t know why it would be a flop, I think it’s a very nice movie. One of my favourite Rajesh Khanna movies (and albums too) Greta. Been hanging out for the LP but it always seems to elude me. I love the song that Raja mentions above as well as LAL CHUNARIYA and ME EK CHOR. Thanks for the review. I’d love it if some of the background music were there on the soundtrack too, although it probably isn’t. But the songs are really nice and so is the film in general. I recommend it!! This, possibly, is the only film I’ve seen where they put Kaka in jeans and white shirt and he rocked it! And, it was refreshing to see someone so patently NOT a ‘steroid stuffed tomato’—normal arms showing through all those sleeveless blue shirt-type thingies (alas worn with a belt on the outside) that was part of his ‘chor’ get-up! And poor Sharmila, never much of a dancer, cast as a ‘kothewaali’ but the Bong directors were v. fond of her and so there she was. She said somewhere that it was Shakti Samanta who taught her how to dance. Sachin Bhaumik had done great stuff for RK prior to this—the screenplay of Aradhana, Aan Milo Sajna (not up there in my RK favs though love the songs), and Andaz. I think he was part of J Om Prakash’s team so after Aan Milo Sajna made J Om pots of money, he let Sachin B. direct this. Sadly it flopped. I loved, as usual, the bits by the character actors and Sujit Kumar saying in his inimitable accent ‘you characterless woman’! But I do not recall seeing the actor who played Tony in very much else—do you know more about him? He was good. As far as being their only film in which they’re happy while young, I guess I’ll have to modify that and say that it’s the only one where they’re generally happy almost throughout :-D In Daag they did get together when young, but after a while. In Maalik they also remain together while young, but that film has a whole host of issues! It also has one of the most moving scenes that I’ve ever seen RK do. They’re together while young in Chhoti Bahu too but there’s angst! And Aavishkar was a different kettle of fish altogether! Thanks so much as usual for doing this. I think yours is the only review of this film that I’ve come across. It’s a shame that many of these relatively decent films get short shrift just because they flopped. In my book, this was way better than many of RK’s big hits. As for the songs, I think my favorite is the Mukesh-Lata duet ‘Haan to main kya keh raha tha’. I really like this movie a lot, it’s very well made and fun to watch. I love love love the scenes with Farida Jalal and Sujit Kumar—man, they had fun doing that! And Rajesh seems very loose and relaxed too…in fact they all seem to be having a good time making this. I somehow don’t quite get the “feel” to this film. …but the songs are good. ….maybe I should give a second try?? I saw this film a few days ago on tv, and I can understand why it flopped. Sachin Bhowmick, who is normally a very talented writer, didn’t come up with a good story. Maybe because this is also his directorial debut, he didn’t spend time on the script. I just felt like the story meandered a lot. I would rather stick with “Caravan,” (1971) a film that Sachin co-wrote with director Nasir Husain, which starred Asha Parekh. That too has songs by R.D. Burman, and was a big hit. I remember ‘Jab andhera hota hai’ being a favourite song as a kid. But not much of the film. Though I do remember Rajesh Khanna in his denim outfit and cap! I covet that night-gown. Would love to see Tiwari in it too. All my screencaps are intentional, dear :) But it was not intentional for the same reason(s) I suspect you love it, but because the nightgown is so very rani pink and therefore my favorite color, and goes so beautifully with the gaudy sheets. “Oh my father” is literal translation of the Hindi phrase “Baap Re”. In Hindi, it is quite emphatic, in English it can only elicit guffaws. Was it really that big a flop? OK, so it wasn’t a hit (it sort of came and went) but it was not in the “Mehbooba” league of flops, was it? – Maybe it was precisely the fact that this Rajesh-Sharmila movie did NOT have the drama or intensity of previous Rajesh-Sharmila combos that went against the movie. Had this been Shashi-Sharmila or Dharam-Sharmila it may have worked. But from Rajesh-Sharmila, maybe people expected a classic, or a movie with depth, like Amar Prem or Safar. They may have found this too “normal”. – From Rajesh, people had begun to expect refreshing, surprising roles. Something new. This role could just as well have been done by a Shashi Kapoor. Rajesh may not have done a bad job but maybe more was expected from a Rajesh movie. – Maybe the story really did not have quite the sparkle to catch the public eye. Besides, a fair amount of the movie seems to have been in the night-time. Am not sure lots of Indians like these sort of movies. As it is, you are sitting in a dark theater. Then you see darkness in the movie, some misery, Sharmila stuck in mujra mode – not exactly the timepass movie you were hoping to see, nor having the depth of an Amar Prem (to impress the more discerning viewers). – The last Rajesh-Sharmila starrer had been Maalik. That tanked, leaving perhaps a bitter taste for a few. Maybe that movie dented the Rajesh-Sharmila aura a bit. I better stop speculating now. May be more meaningful to catch hold of some early 1973 Filmfare magazine issues. There may be some explanation there. It may also be useful to see which movies were released around the same time as Raja Rani (a month here or there). Besides, maybe we should see this from Sharmila’s point of view and not just Rajesh’s. None of these movies did well at the box-office, inspite of impressive co-stars. Maybe it had to do with storylines but it also shows that Sharmila was not that magnetic a presence in a movie as is sometimes portrayed. Amar Prem (1971) was outstanding in many respects (she was excellent too) but after that she had her series of meh-movies. Since we are anyway in speculation mode, if this may have done better as a Shashi-Sharmila movie, there is every reason to believe this may also have done better as a Rajesh-Yogeeta movie. At least then there would be more curiosity about the combo. And I think Yogeeta may have carried herself off better in this role. Just my gut-feel. Maybe people were tired of both of them! :) I get tired of seeing the same people over and over again (except Shammi). Well Raja, the Rajesh-Sharmila jodi did come back with a bang with Daag which released a few months later. Raja Rani was a January 1973 release and Daag was end April-May I think. So their pull factor perhaps wasn’t the issue. Also, Sharmila had a very successful release in Aa gale lag ja in the same year. I think Greta has a point though—Rajesh had 10 releases in 1972, probably way too much and folks were not in the mood for something that wasn’t really ‘hatke’. This is a sweet film but doesn’t have the drama that most of the big hits generally have. In retrospect though it’s these ones where Rajesh is eminently watchable because he gives a relaxed, unhurried performance. The weight of stardom doesn’t seem to be apparent. I find that most of my Rajesh favs were not huge hits like this, and Joru ka Ghulam, Dil Daulat Duniya, Shehzada, Palkon ki chhaon mein, etc. Perhaps because they were all happy ones and didn’t have him crying over lost love or dying :-) though those are nice too! And noooo! Not Yogeeta in lieu of Sharmila in this one. Daag released in 1974, so it was at least a year later. 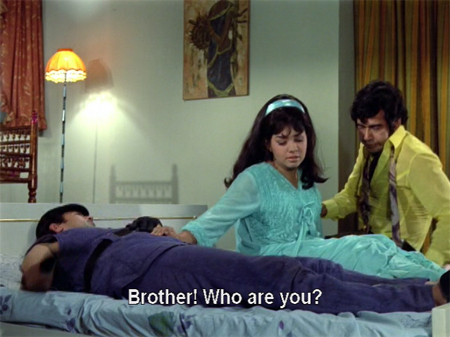 Point to note was that Amar Prem (1972) was released just the previous year. This film in my opinion surpasses even Aradhana (1969) when it comes to the touching moments. So I presume the expectation from the audiences was definitely much higher from the lead pair. How would it be if Abhishek and Aishwarya Bachchan were to star in a comedy after Raavan (2010)? I guess the reaction from the public would be the exact opposite !! Nope on Daag. It was Rajesh’s first release, in April ’73, after his marriage to Dimple in March. His 1973 releases in sequence–Raja Rani (Jan. ’73), Daag (Apr. ’73) and Namak Haraam (Nov. ’73). @Suhan – Sorry about that, yes you are right. Daag was in 1973. What about Aavishkar? Was it before or after his marriage? year. He had a good run even in 1974 with Aap Ki Kasam, Roti and Aaina. I can’t believe that just Zanjeer (1973) from Amitabh toppled Rajesh from the throne. Was it because of Dharmendra as well? Dharmendra did have a good share of hits in 1973 – Yaadon Ki Baarat, Jugnu, Kahani Kismat Ki, Keemat, Blackmail and Jwar Bhata. Or was it due to other circumstances? Shashi – Hmm, maybe Raja, Atul et al who have such great stories from those times will be able to shed light on this. I think though that because he had about 4-5 flops in a row before Daag, that the ‘phenomenon’ sheen had worn off. If you see Memsaab’s post on ‘Bombay Superstar’ and Asli Jat’s channel on youtube where he’s uploaded it, Rajesh and the industry were jittery about his fate. He himself has said elsewhere that he went through a terrible 14-month period of self-doubt, etc. from which he recovered only when he had his string of 3 jubilee hits in 1974 with Prem Nagar, Aap Ki Kasam, and Roti and a moderate hit in ‘Ajanabee’ and critical acclaim with Aavishkar (Aavishkar, though completed in 1973, didn’t release until 1974 and he got the Filmfare best actor award for it in 1975). So I guess despite his marriage, and Daag and Namak Haraam, 1973 didn’t mean much for him :-)? 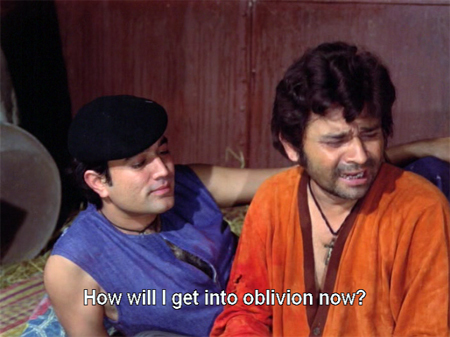 You’re right about Dharam and his run in 1973. 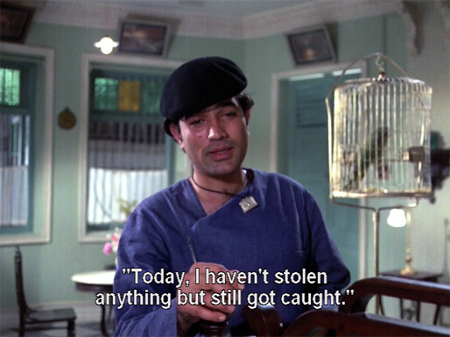 About AB, from what I’ve been able to glean, the toppling didn’t really happen until Deewar and Sholay in 1975. Raja, How do you catch hold of back issues of Filmfare? 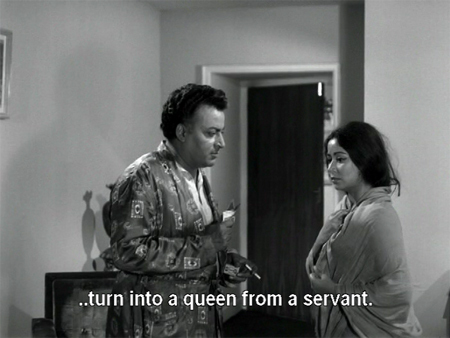 I’d never seen anything very much of this film until Suhan suggested one of the songs for my Mukesh post. Now, even more than since then, I want to see Raja Rani! 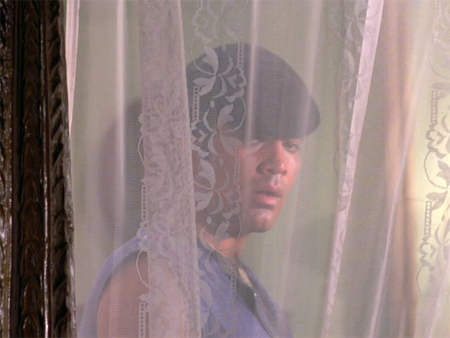 Kanu Roy is in China Town, by the way – he’s Inspector Dutt, who first notices the resemblance of Shekhar to Mike, and decides to use Shekhar to infiltrate the Chinatown gang. From what I remember, this movie was not a big success. But it does not mean that the movie may have necessarily flopped. Yes, I agree with raja that Sharmila Tagore may not have been as big a draw as many people think. The only lead actress that was a sureshot draw those days was Mumtaz. I do not think Sharmila had the star power to attract movie watchers to the movie halls. People expected a lot from Rajesh Khanna movies after a string of big hits, and this movie was obviously not in the same league, and that is the reason for this movie not doing well. I as a kid felt like a sence of deprivation when I missed watching “Seeta and Geeta”, but I never felt that I missed anything by not watching this movie. In fact, I think that Rajesh Khanna’s fall from superstardom had begun in 1973 itself, with movie like this. For a couple of years, Rajesh Khanna had mixed years, then from 1976 onwards, his flop movies began to outnumber the hit once and a time came when Rajesh Khanna movies began to fail at the box office, no matter what. That’s interesting Atul. I personally like Rajesh with Mumtaz but I didn’t know Sharmila did not have the star power to bring people in. In the late 60s, she was fabulous. Memsaab, so this is one of your favorite RK movies? I liked your Roti recommendation so I’ll trust you on this too. This is completely different from Roti, very simple and sweet…but it’s fun. A well done story with good humor and everyone having fun. Atul – I guess you can also add Hema Malini as one of the heroines who could draw the crowds to the theater. She had a very good year in 1972 what with hits like Seeta Aur Geeta, Gora Aur Kala, Bhai Ho To Aisa and Raja Jani. Her good run continued in 1973 as well with Jugnu. So she was definitely an actress of reckoning those days. Yes, Hema Malini was a star material throughout 1970s. Any reason for change of heart??? Dont you think the response is awesome??? Ha ha Heyman :) Sorry–I was in NYC and had no internet connection (!) so missed a great deal of activity here, especially on behalf of Rajesh K.
Rajesh and Sharmila were also there in a movie called ‘tyaag’ in ’77,their last movie together. I remember ‘desh premee’ and ‘kati patang’ having similar wedding sequences where bride and groom are unaware of each others identities. Mumtaz guest appearance was good. Mumtaz-Rajesh pair actually had an “aura” rather than Rajesh-Sharmila. who else did a cameo in the film? I just saw Tyaag recently…they were miserable in that for the most part. Rajesh Khanna and Sharmila Tagore did star in Chhoti Bahu (1971) where they were young and still together. 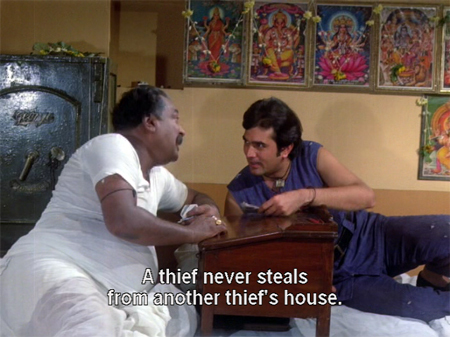 I guess Aavishkar (1973) also falls in the same league. So you see its not always weepy weepy movies for these stars. Well, at least Indrani only played his mother when he was a wee little boy. More of a flashback to the past than anything. I haven’t seen Chhoti Bahu (I tend to avoid titles with Bahu in them because they invariably annoy me). Aavishkar is not what I’d call a happy film though :D Rajesh-Sharmila are not weepy either, they are just plain TRAgic. Please post more pictures(fotos) from this film Raja rani. Infact more than google its the pictures which you post in sites that look more nice– that is exactly as good as it appears in the original film. in most of the sites the images from such films are boring. I would love to see you post more pictures from Rajesh Khanna’s films that too those which are not posted by Others. also do not personalise the reviews by taking names of ur frds as it disturbs the review.This is my observation. I love to read the reviews posted by u .
I like talking about my friends as long as they don’t mind. You can skip over those parts :) And I’m happy to write about Rajesh and his films too, but screencaps take a long time and I think I already include probably too many of them for some people! Nice review Memsaab, saw this a long way back & remember it as a fairly pleasant movie, but no classic. The songs were good though, especially the ‘Chor, Chor …’ refrain song, very atmospheric. If I remember, on the soundtrack album one of the songs listed both Rajesh & Sharmila as artists which intrigued me. I found out later that they didn’t actually sing but their dialogue was part of the song ! Always check the face under the ‘flower-bedecked turban’, otherwise you never know who you’re marrying ! After reading comments on Sharmila not having star power in the 70s, i thought i will add my two bit! I think she did have quite a few hits in the 70s too like Daag, Mausam, Chupke-2, Safar, Aa Galey Lag Ja etc. The Rajesh-Sharmila jodi I think was very successful except for a few flops. I also think that Mumtaaz and Sharmila belonged to two different leagues in terms of choice of film roles, acting etc which made it rich for the audience to enjoy RK movies with both of them. Amanush was a 70s box office hit too for Sharmila. Amanush had some good songs, story and acting both by Sharmila and Bengal’s super star Uttam Kumar. I think that was based on a bengali story and there was also a bengali version of the film. Yep Sharmila is one good example of a woman successfully managing a professional acting career with family commitments. Many of her movies were a hit after her marriage and she was in demand for quite some time. This film shares many actors with the cast of Aradhana’ and Amar Prem. In the ‘Eye’ song it seems like Sharmila is still wearing her ‘Roop Tera Mastana’ (from Aradhana) attire. I’m not sure how well this movie was recieved, but if it was not as successful as the other two, it could be due to the deja vu effect. @Memsaab however, if this is one of your favorite RK films, that surely counts for something. the only reason iam asking you to not mention the respective friends name is that as a layman when he typesin google the films name say tyaag,raja rani its your review that a person will read.i wnt the review to be realistic. yes your reviews are great but when a name comes in between of a friend who is not a notabl;e figure related to the film then the reader will think lowly of the review. I don’t think mentioning a friend’s name detracts from the worth of the review or makes it any less ‘realistic’ – in fact, I feel that it makes the review a more personal one, and therefore more interesting and more believable. I would rather read a memsaab review, replete with humour and ‘lowly friends’ names’, than the sort of reviews one often finds on imdb. So much more substance, here. There is a reason this is a personal blog and not a wiki or imdb entry. Being a personal blog, the writer is under no compulsions to comply with any defined format. Of course, one might not want to see sausage being made and that is valid. In general, I like Memsaab style reviews. I usually look for these reviews after I’ve seen the movie because I’ve invariably missed out on some of the fun. Lagi raho, Greta! I love your writing in all forms – reviews, vignettes. favorites list, etc. As the perennial high school Yearbook sign-off exhorts – don’t ever change. The reviews here are far better than those contained in “professional” sites like wikipedia, imdn etc. Those reviews are dry, dull and lack soul. Those who have sense of humour and who want their reviews to be full of life will find these reviews here the most useful. Thre is no way that the “professional” sites can ever come up with the queality that is contained in the reviews in this blog. The reviews of this blog are quite influential too. Personally I think these reviews have helped change the mindset of many people towards so called C grade movies and lesser known actors. Thanks to the reviews contained here, peole like me have discovered the wonderful world of C grade movies amd lesser known actors. I have discovered Laxmi Chhaya, Bela Bose, Nazir Kashmiri, Chandramohan, cheerful Meena Kumari etc from this blog. I and others have learnt some useful terms like “Nahin” face, purdah “lite” etc from this blog. We have come to love baddies like Ranjeet and comediens like Tuntun thanks to this blog. This blog has helped identify some obscure actors whose identities were not known to anyone earlier. And this blog has helped lead to a silent revolution in the quality of DVDs that Hindi movie watchers were subjected to. Regular visitors of this blog have helped create some wondrful DVDs full of improved quality video and proper sub titles, something that the so called “proper” DVD distributors have failed to do so. One needs to be patient and persistent and be willing to learn with an open mind. With time, the reviews of this blog will grow upon you .If one does not have these qualities, then he may find it difficult to come to terms with the quality contained in the reviews in this blog. The loss will be that of the reader, not the blog. Personally I thing this blog is a platform that has allowed many likeminded people to come under one cyber roof and exchange notes on Bollywood movies of the golden era. And such exchange of notes will invariably lead to taking names. And why not ? Keep it up Memsaab. Great work! I love the frankness easy going genuine sincere opinions. Referring on any helps, assists or references are actually very professionals. These are normal practices in writing journals and academic works. You mean lovely AND lively RK encyclopedia ;-D And I agree—it’s always good to give credit where credit is due! Yes! I am convince she is lovely as well. Radzi, Greta :-D The ‘lowly’ one blushes! But G, I hope it’s looks you’re referring to and not the mind and all that :-D If the latter, then there’s a fighting chance to successfully stalk and beard the elusive ‘original superstar’, eh?! Oh lovely Suhan, we ARE going to trap him one day in our inquisitive and adoring web. And he will love it. @Shrikant – I guess Greta’s blog posts will be incomplete without a mention of her friends. Thanks to her, not just the famous names, even her friends have become stars for me. This is because of the valuable information that we get about Bollywood from all of them. Even though we may have never met in person, we still are like one big family. Full credit to Greta for this. Hi Heyman :) Glad you are having fun! Oh yeah—I forgot to ask what on earth a golgappa IS? I picture a fish with big bulging eyes, but it seems more likely to be something laddoo-like. In any case, it is an awesome word. Maybe I will name my next dog Golgappa. Golgappa is the small round fried puris which are filled with spicey tamarind/jeera water and other tasty things. The vendors in India will usually serve one golgappa at a time on ur saucer and you gulp the entire golgappa at a shot! It is a treat you grow up with. Most Indians overseas continue to serve golgappas at parties or you can get them in any desi store in any of the western countries. A bag of golgappas can be bought from the store. All you need to do is to make the fillings and the sauces that go with them – pronto u can have a party with friends! Perfect dog name. If you don’t I will. Not sure if you tried it last time you were in India. It’s so much fun standing on the roadside and gulping them down. I had seen this movie more than a decade ago, when I was still in school and when I was head over heels in love with Rajesh Khanna. But at 13-14 I somehow didn’t like the movie much. I have to give it a re-try now. I had seen Amar Prem, Daag etc and maybe it was that image I had of the lead actors that I didn’t like it much. I hardly remember the story except for the two songs – Main ek chor tu meri raani and Jab andhera hota hai . 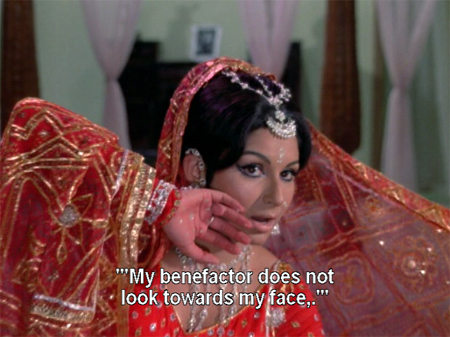 And the climax where Sharmila borrows some jewellery from a friend (Aruna Irani?) and loses it. I hope this scene’s from this movie. Now I’m all confused. Like Suhan, even I like Kaka’s lesser hyped movies than the likes of Aradhna, Do Raste etc. I liked Raja’s speculations. He has pointed out some very valid points. After Amar Prem, Safar, Daag – I, didn’t like this movie much. So, guess audience did like seeing them separated rather than happily together. But tastes change over a period of time. I am sure I will have a different opinion about it if I watch it now. In one of her interviews with Radio City Sharmila said she wasn’t very interested in doing Dastaan . She didn’t like the fact that Bindu had a meatier role than she had and she was getting married around that time and was busy at home with shopping and other preparations for her wedding due to which she couldn’t concentrate much on the film. As a white person I am not allowed to eat street food :D I have had homemade pani puri though, and I’m sad to say that I didn’t like it at all. Maybe I would like it better if I called it golgappa though!!! Why not Aradhana? It had some lovely songs and I think Rajesh and Sharmila were a real good jodi! Typically Indian women are very fussy about cleanliness etc when it comes to eating outside stuff. But the same Indian women think nothing of eating pani puri/golgappa from road side stalls served by unkempt vendors. I have never been able to understand how and why Indian women forget all their scruples about cleanliness and hygeine when it comes to eating pani puri/golgappas. I personally dislike eating it, and avoid eating it, even if the two women in my life try their level best to make me eat them. Since sunheriyadein brought up Amar Prem, there is a scence where Om Prakash has golgappas with whisky. They’re better with the spicy water though. Memsaab, I’m not white but I too have problems in India with eating anything outside (leave alone street food.) I found out something though–if you visit India often enough, you get the resistance to the germs. I visited in April last year (got sick) and then in December I didn’t. That was the first time I ate out without consequences. Indian street food is the best! Whenever I go to India, I avoid eating home-cooked meals and head for the street stalls. My motto is that if I’m going to get sick, it better be in service of eating great, junk food! Memsaab, I too avoid eating at road side stalls/ juice bars when I visit India. However there are plenty of other good places where one can still enjoy all this yummy food. Nothing to beat India for the sheer variety of food and eating places ! Quite a few of us (desis in videsh) fall sick when we visit India. But as Sophy says if u visit often then u develop resistance to germs and don’t fall sick so often. I recently saw Do Raaste and liked RK in it. He was also good in The Train. Next visit home, I want to get Itefaq which is supposed to be a hatke (diff) RK movie. 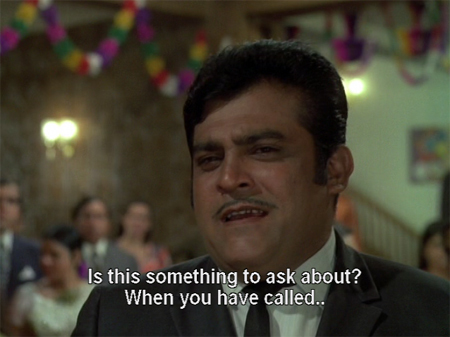 @Filmbuff – Go for Ittefaq(1969), if you like the suspense/murder mystery genre. The movie does not have any songs and direction is awesome by Yash Chopra. @Suhan – How was it for Rajesh Khanna in 1969? I know he became a superstar that year, but from whatever, I have read, Aradhana released sometime in November followed by Do Raaste a couple of weeks later. But he did have Doli and Ittefaq which were also declared as hits the same year. Did all of this happen in just a span of 2 months? Thanks Sashi – will do. Yash Chopra did an awesome job directing Deewar, Trishul, Waqt etc. I bought a spate of old hindi movies on my last visit to India – mostly 60s and 70s oldies and am having a fab time catching up! Shashi – I know that the ‘Ittefaq’ premiere was some time in October ’69 because somebody had put it up on youtube but of course, got suspended for his pains :-( I think it may actually have released before ‘Aradhana’. Thanks Suhan for info on ittefaq. Nope I don’t need subtitles and infact picked up a no of old movies on VCDs that don’t have any options. The down side is the poor quality of movies on VCDs. Rajesh Khanna was an artist/actor in his late ’60s and early ’70s movies. He somehow had the tendency to act like a “superstar” in his later movies….as if he forgot how to act. He was confused about being an actor or the “superstar” that was once crazed. ..Often time he “over-act” just to be bold as he was the superstar! Doli is a total RED MIST movie. Ugh ugh ugh!!!!! Horrible film. Thanks Suhan. Aradhana is listed as being released on 7th Noember 1969 in Wikipedia. So, I guess Do Raaste released on 21st November. Looks like you are right, Ittefaq must have released before Aradhana. I have watched its premier video on You tube sometime back and I must admit that Rajesh Khanna did make an entry like a superstar in an Impala(I think). He was dressed in a beige suit (if I am not wrong) and looked very handsome. Doli has Rafi singing for Rajesh Khanna, so I guess it must also have been released before Aradhana since the ‘Sapnon Ki Rani’ craze may not have begun yet. All-in-all, very useful info on the first superstar of Bollywood from you Suhan. Thanks very much ! Intefaq started making while Do Raaste was halfway in production, but the song-less thriller was made in a hurry & got done earlier than Do Raaste….and was released earlier too as Shashi said above. sanIts one of the classic movie of Super Star Rajesh Khanna and it was box office movie during 1973. He never had tendency to over act in any of his movies. He is real Super Star of Indian Cinema. As Radzi acknowledges above, Rajesh over-acted plenty of times. He was a good actor, no doubt about it, but acting well and “performing” were two different requirements both from directors and audiences. And Ranibai never holds Raja responsible for her becoming a courtesan, and nor should she. THAT responsibility falls squarely on her in-laws and aunt and uncle. Rajesh Khanna tend to over-act when he thought some of his “stereotype” mannerism was demanded by his fans…and that he was beeing obviously bold about “performing” that. ….and some of the less commanding directors of the later years just probably let him decide too much. Under older director like Shakti Samantha, Asit Sen, Manmohan Desai, etc. , Rajesh was being “controlled”. Interesting insight Razdi. It is quite possible that directors who were senior in the industry did not hesitate to take control irrespective of the star rankings at the time. I remember reading an interview by RK where he talked about Haathi Mere Saathi. The director Chinnappa Devar was a hard taskmaster and did not like RK’s latecoming habits. But probably not wanting to antangonize RK, Devar would vent out his anger on one of the spot boys, even getting physical at times. Fearing for the boy, RK was never late again for the shooting of this film. Incidentally, Haathi Mere Saathi was the biggest grosser that year (1971). In the video of Bombay Superstar which Memsaab has so kindly reviewed, one can find that Hrishikesh Mukherjee too did not start work on the sets till RK came and personally explained the reason for his delay. rajesh khanna is the only real superstar who has done variety of roles, has brought different characters alive on screen. he has never over acted in any of his films .How could one even say– sharukh did overact in phir bhi dil hai hindustyani,raam jane,english mem desi babu,trimurti,asoka etc..
amitabh in jadugar,toofan,mard,sadhu sant,hindustan ki kasam,besharam,ganga ki saugandh etc..
but where has rajesh did??? Although a big fan of Rajesh Khanna, I admit that Rajesh is limited athletically….and he is/was limited in action scenes. Even his running and kicking look weird. But he was perfect for dramatic scenes, romantic scenes, and “cry-baby” scenes….especially in spicing juices to soul-up songs sequences. 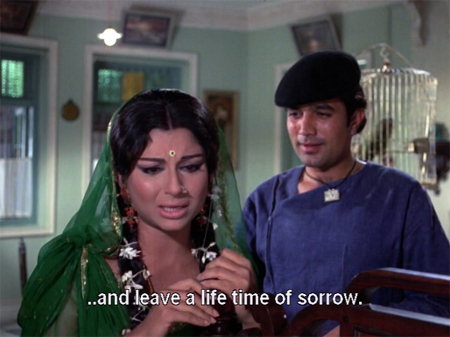 Nobody beat Rajesh Khanna facial expression! rajesh khanna is the best actor ever. he always acted well .It is just matter of time.I think if he had maintained his face and weight then no body could have even come closer to him in competition. Memsaab, you’re too much:-) You beat me to “Raja Rani” and the scores of posts are just great. Given your love for golden-era RK, I’ve dreamed forever of your reviewing this one along with Raja Jani, the Dharmendra-Hema Malini starrer. Talk about a tale of two “Rajas”, and in more ways than one. Growing up, I remember having a sinking feeling about Rajesh Khanna’s career when “Raja Rani” flopped, yet “Raja Jani” in 1972 had been a huge hit. Then as now, I found “Raja Jani” crass, loud and oily – literally: check-out those unforgiving close-ups of Hema’s face. 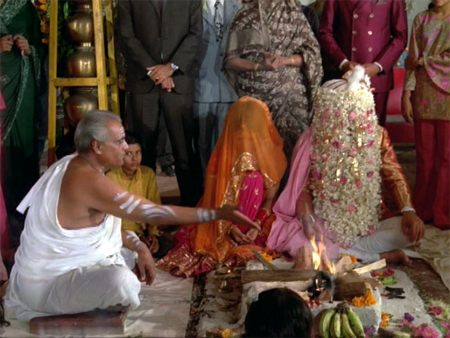 Plus, I could never figure out why Dharmendra looked just so damned uncomfortable and took such a back seat. This is what a hit felt like? By contrast, “Raja Rani” was and will always be…sweet. You nailed it: the only word for it. Fantastic songs, a heaven-made jodi with RK-ST and just an enjoyable air about it. Is the problem with “Raja Jani” that it also seems – as it did upon release – an all too unimaginative a mash-up of RK hits? The early wedding scene? “Kati Patang, ” right down to the pink of Asha Parekh’s wedding saree (I think – or does memory fail me?). Sharmila’s character and whole courtesan scenario? “Amar Prem” but with diminished tragic overtones. It all felt so lite: more Fanta than the sherbert we were used to getting from RK. Watching it, you get the sense they were milking the superstar cow, and perhaps it felt like Rajesh was already coasting. I must say, I took its flop very personally – as we did with all things RK in the early 1970s. The marriage to Dimple was shocking enough, so you can understand how this must have felt: both life and movies becoming a disaster. I hope no one find this hard to imagine: we had that much invested in the man, including this 12-year-old hyper-fed on Stardust and Filmfare, and about to leave Tanzania for Canada. All around, things would never be the same. Interesting comments Shaffins. I never heard of Raja Jani before…until you mentioned. I thought Raja must be paired with Rani. Jani on the other hand must be paired with Tarzan? Raja Jani is Dharam and Hema :) It’s an okay film, but could have been better. Was disappointing considering the cast. Well Radzi ji, that is no issue you know, cuz while Raja Rani was a Flop, Raja Jani (Dharmendra-Hema) was a big hit and surfaced as one of the most successful films of 1972..So suit yourself, Thanks?? Raja Rani had great music, good caste, good intentions, great expectations, great R D Burman backgroud score but the movie had a flawed screenplay. A lengthy beginning and the movie had sadness written largely on the canvas. It was pathos and did not have the spirit of Amar Prem. It leaves you thinking that the world is a sick place where people who want to be reformed have no chance. It lacked the feel good factor of Anand, Amar Prem- tragedies with flicker of hope. This is the precise reason that it did not have a repeat value apart from the CHOR sequences or the back ground score of RD and thus did not do that well. One question…why is your handle the famous Japanese mafia organization? I fail to understand how people say that kaka’s downfall began inj 1972 itself. Sholay released in 1975 did not find mmany takers & ramesh sippy had to release it himself. Also, even as late as 1987, kaka had close to 16 releases, which is quite a record. If his movies had been flopping consistently, he would not have had so many releases. Producers are not fools to invest in a non bankable star. Raja rani was not a flop. It did fairly well, maybe not as big a hit as some of kaka’s monstrous hits. Rajesh looked highly relaxed & gave a free spirited performance. Sharmila also matched him well.